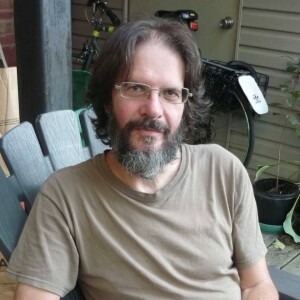 Jack Ruttan is a Montreal-based artist, cartoonist, and writer. Born in Calgary, he graduated from the University of Calgary with a Bachelor’s degree in Humanities, majoring in English Literature. He later attended the Banff Centre for the Arts, taking part first in the Writing Program and then in the Music Theatre Studio Ensemble. Jack has written scripts and narration for the TV science show What’s That About? and he has published articles and reviews in magazines such as Books in Canada, Canadian Art, and La Revue Espace. He was art critic for The Montreal Mirror for a period in the 1990s. His monthly cartoon feature Ruttan appeared in Books in Canada in the early ’90s. Jack has also published cartoons and illustrations in Matrix Magazine, Fish Piss, and MensuHell, among others. Jack is a self-taught artist in watercolours and pen & ink, following the example set by other artists in the family. His mother Irene Ruttan painted and exhibited watercolours. As a member of the Calgary Sketch Club in the first half of the 20th century, his grandmother Loveny Ruttan sketched with Group of Seven member Arthur Lismer. Jack’s uncle Roland Gissing was a well-known Western Canadian artist in the 1940s. Jack has exhibited his artwork in venues such as TADU Contemporary Art in Bangkok, Thailand and the Twist Gallery in Toronto, Canada. He currently resides in Montreal, where you might see him sketching in parks or on his front porch. You might also catch him cycling around the city snapping photos for future projects, or painting portraits in the street at special events. The House of Cats refers to Jack’s living set-up rather than to this website at the moment, but check back. Cats do show up in the pictures from time to time.